Hibernation...who's got time for that? With calendars packed to the max, never-ending errands to run, and social calendars galore, reality just doesn’t leave space to hibernate. But for some of us, that's all we can think about. Although evolutionarily there were benefits to this behavior, times have changed. Unfortunately for some, our bodies haven't kept up. Simply, SAD is a Major Depressive Disorder that is Recurrent with a Seasonal Pattern. 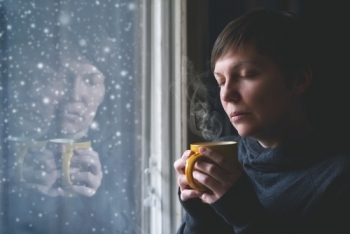 Curious about whether or not you’re suffering from a winter depression? Take the online self-assessment titled, “Your Current Level of Depression" to see how many markers for SAD you have. Print your results and share with your healthcare provider. Sad is the body's response to the seasonal shift in the amount of daylight. A person's circadian rhythm can be affected when the nights become longer and days become shorter. Our bodies are programmed to equate darkness with sleep, so the loss of daylight means our bodies want to go to sleep earlier and sleep longer. This physiological process is driven by melatonin, which the brain produces in larger quantities during the fall and winter. Melatonin is responsible for helping the body fall asleep, so when it's introduced into the system in larger amounts and earlier in the day, thanks to the early sunsets this time of year, it can make people feel sluggish. Also, during fall and winter, we know that serotonin, a naturally occurring neurotransmitter in the body lowers, affecting one's mood. Sometimes to increase serotonin, people consume more carbohydrates. Why? Because this indirectly increases one's serotonin-the more serotonin we have available the better we feel. Despite these benefits, I wouldn’t suggest going on carb binges anytime soon because there are healthier ways to manage your SAD as you will see here! Some people are at greater risk of developing SAD than others. Generally, we tend to see it more often in women than men. Living further from the equator (i.e. at higher altitudes) where the nights are longer. We know SAD can run in families, so one may have a predisposition to develop it. It's also more likely to hit someone who has a history of depression or mood disorders. Since there aren't any particular medical tests that can be performed to diagnose SAD, it's very important to know your risk factors. Since the symptoms of SAD can be similar to the symptoms of other medical conditions, your doctor is likely to perform tests (e.g. blood work) to rule out other medical conditions. The first line of treatment for moderate levels of SAD is light therapy also known as phototherapy. If you have milder symptoms of SAD, try to get more access to daytime light. The best time for this would be around noon when the sunlight is the strongest. Even though it might be super cold, put on a coat and try to spend approximately 15 to 30 minutes outdoors. If going outdoors isn't feasible, find a window that would be conducive to allow the light to enter the eyes. For some however, this isn't enough. When this is the case, SAD is treated with light therapy using what is a called a "light box." Basically, it's a box with bright white fluorescent bulbs with UV radiation filtered out. The typical intensity of this light is 10,000 lux with an average daily exposure of 30 minutes, which is ideally administered in the morning. Since everyone's circadian rhythm is different, take the self-assessment online titled, “Your Circadian Rhythm Type" to know when to administer light therapy. It's important to know there is help for those who suffer from SAD. If this describes you, reach out to your medical doctor or healthcare provider to determine if what you are experiencing is SAD. And before you take measures to treat your symptoms, learn about your treatment options. Unsure where to buy SAD products, check out the Center for Environmental Therapeutics and click on the “Shop” tab. Also, if you’re someone who enjoys being on your computer up until bedtime, it’s a MUST that you download f.lux. This filter will automatically adapt your screens brightness to the time of day. Wow, this is my husband to a T. He is such a happy person, but when the weather turns cold, he looses his motivation. He just wants to sleep all the time. I think I'l going to show him this, so that he knows he isn't alone, and I'm sure he will be willing to get some help.